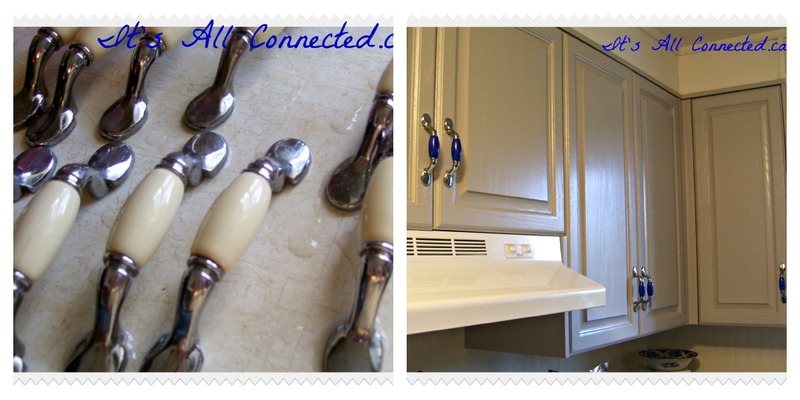 I can't wait any longer to show you this amazing transformation on the kitchen knobs! The kitchen reno was scheduled for after my rental property sold. Alas, that hasn't happened yet and it's sucking the financial life out of me! Now, I'm scrambling to give the kitchen a new look the cheapest way possible. If you missed Part I of how I got into this click here. The original handles on the 1985 cabinetry disintegrated a couple of years ago and I replaced them with some chrome and porcelain knobs that were in a clearance bin for $1 each. They were pretty boring but only intended for temporary use. Now, I have to find a way to jazz them up. The cost was zero and you won't believe how it's done! I'd pinned this technique from a blog called Teal & Lime. She has great ideas and you should pop over and check her out! I had one Sharpie in the house and it was dark blue. Cobalt blue is the colour I'm using for accents in the kitchen. I coloured in the porcelain bits, moving in the same direction for all the strokes. This is super simple to do and took all of about 10 minutes to do 17 knobs. The ink will smear so try not to touch it until it has a couple of hours to dry. 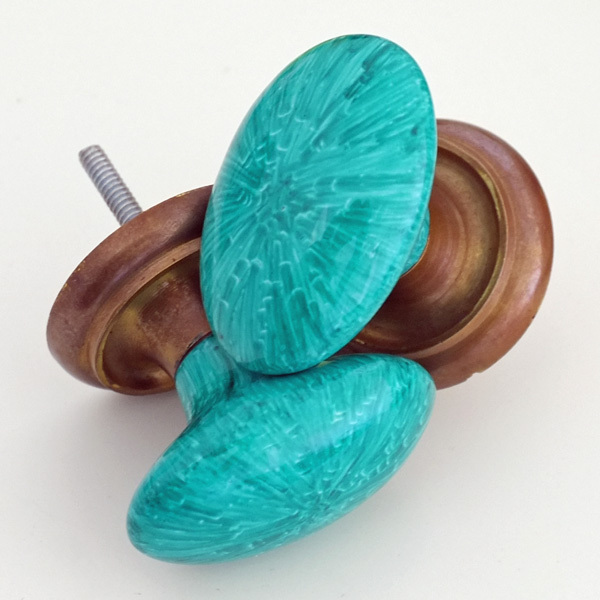 This is such an awesome way to personalize those cheap, boring porcelain knobs! Heck, you can do it with any ceramic that can take 30 mins. of 350 degree heat. Dresser drawers will never be the same around here! Cost for this part of the kitchen redo was ZERO! Thanks, Jackie! Hey that is amazing! Sharpie, go figure. I think the lines do make it look gem like that's awesome Maureen! Brilliant Maureen!!! They look beautiful - and I totally agree that those lines look gem like - wow - I'm amazed, they look like they cost a fortune! You can't see the lines in the dark colour. I'd stick with Sharpie brand as I've heard some other markers change colour. Amazing. I wonder how Jackie stumbled on that idea. Guess I'd better hop over to her blog. Your handles look cool! I'm a major fan of cobalt. Wow! This is a brilliant idea. Sharpie markers are the best - so many uses for them! 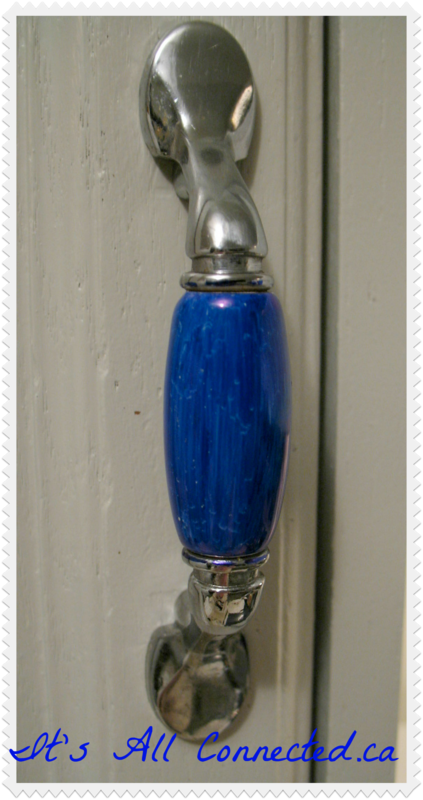 Your cabinet handles look amazing! Great job. Also, I love the color of your cabinets. Do you mind if I ask what color you used? I'm getting ready to paint some cabinets and I would love to try out your shade. Thanks! I just read Part I of the kitchen reno and got the paint color! As soon as I hit "publish" on my comment, I thought, hmmm....I should have read the part 1 post to see if the paint color was there before I asked the question - haha! Thank you for posting the color! The handles look great Maureen. I find that a camera often picks up things that you can't see with the naked eye. 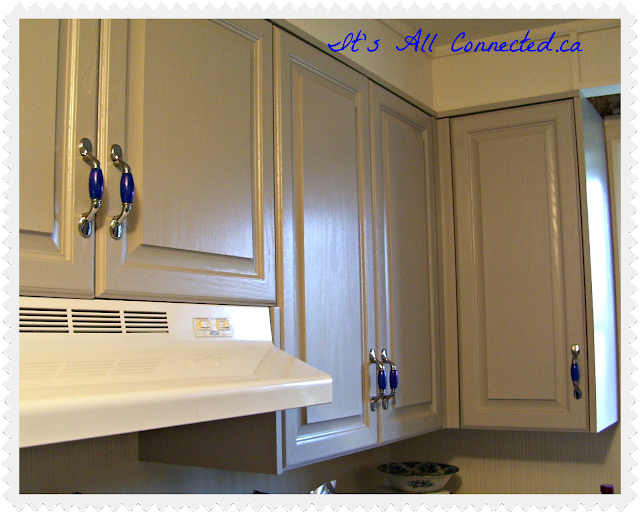 They look great on your newly painted cabinets - can't wait for the whole reveal ! Supreme. This girl bows down and tells you its fantastic. Love, love, love your kitchen accent color. Ha ha,...that is brilliant. How in the world was she brave enough to try it out. Well, whatever, good news for you. This is really getting exciting. Can't wait to see it all together. This is my kind of makeover - free! And they turned out great. I LOVE how the "unevenness" is part of the appeal - no perfection required! Thanks for much for sharing this. Will definitely keep in mind. That is brilliant. I like free too. 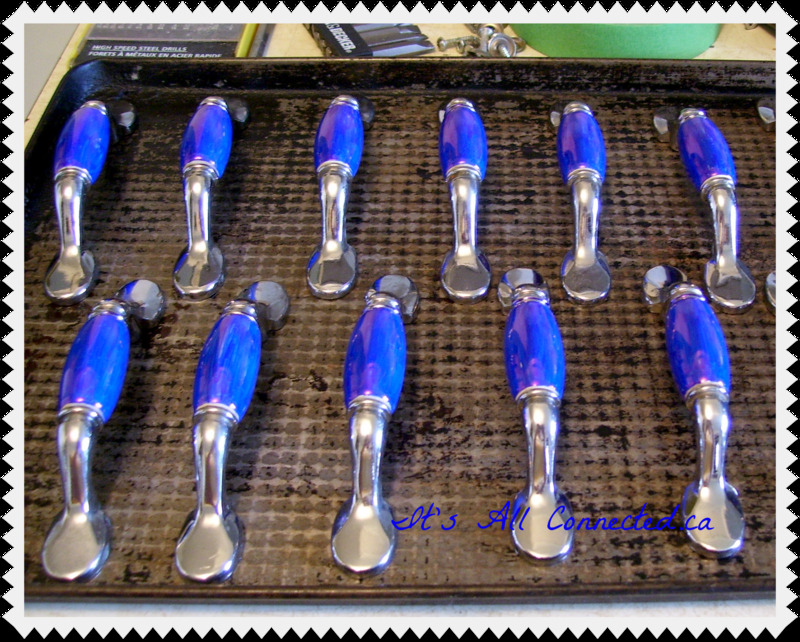 What an amazing cheap idea and you know how much I love blue, cant wait to see the kitchen, it looks so bright. Great job Maureen. Holy smokes Maureen! I'm catching up after my 11 day hiatus and I sure picked a good blog and post to start with!!! This is amazing and I am so trying it out on some other porcelain stuff I have! Rockin girl! Darn that Sharpie comes in handy!! Yuse a genius again Maureen...looks fabulous! very nice! I love how they turned out - so pretty! What a brilliant idea, and they look great! Oh you clever girl! These are lovely! I love the blue, it is a happy pop of color in the busy kitchen! I am still collecting all of your super-inexpensive kitchen tips. I have decided to start after Christmas. 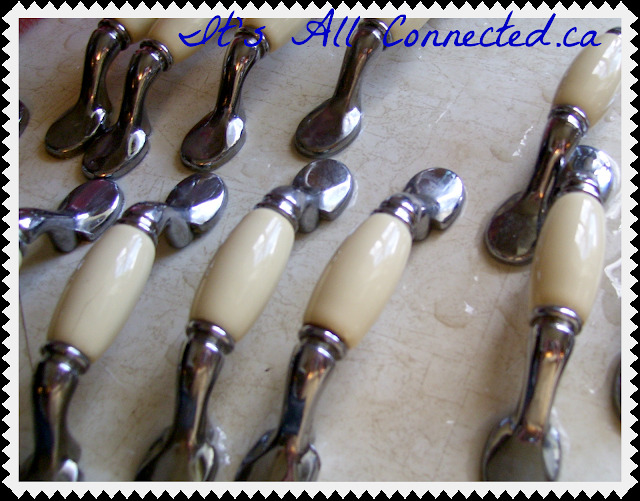 After reading this I will be looking for some porcelain knobs to redo. I seem to remember a bagful of them for $2 at Habitat. hi Maureen ... just catching up on your blogs and this idea is exactly what I need. Your handles look great and so much like mine that I need to change. I have some questions, so will email you. Take care my friend. What a genius idea, Maureen!!! Love it!!! They look fabulous in your kitchen!! What a great idea! The hard part would be what color to choose! Yours look really good in your kitchen!